This award was earned from Mova Nugraha and I would like to sincerely thank Mova Nugraha from the bottom of my heart for this award ! * Put the logo anywhere in your page or post. * Add a link to the person who awarded it to you. 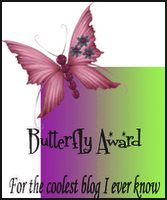 * Link 10 other blogger of whom you want to give this award to. Folks, do drop by my friends blogs above and enjoy yourself there !! Congrats my friend on the award. Thank you for the nice award Jinghui. I am honored. It’s my honor to get the reward from you! I am touched by your kindest thought. Thank you very much. Thanks for the lovely award Jinhui!!! First of all, congrats – you deserves this! Thanks also for passing it on to me! I’ll try to return the favour when my suffering back is getting better. Thank you everybody for your kind comments & support for my blog ! Apologise for not replying to individual blogger comment, well wishes and blessings ! Wish all of you Happy Blogging !